Making war on light pollution. In 1610, Galileo Galilei published a small book describing astronomical observations that he had made of the skies above Padua. His homemade telescopes had less magnifying and resolving power than most beginners’ telescopes sold today, yet with them he made astonishing discoveries: that the moon has mountains and other topographical features; that Jupiter is orbited by satellites, which he called planets; and that the Milky Way is made up of individual stars. It may seem strange that this last observation could have surprised anyone, but in Galileo’s time people assumed that the Milky Way must be some kind of continuous substance. It truly resembled a streak of spilled liquid—our word “galaxy” comes from the Greek for milk—and it was so bright that it cast shadows on the ground (as did Jupiter and Venus). 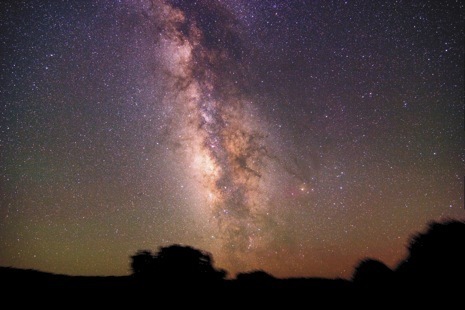 Today, by contrast, most Americans are unable to see the Milky Way in the sky above the place where they live, and those who can see it are sometimes baffled by its name. In Galileo’s time, nighttime skies all over the world would have merited the darkest Bortle ranking, Class 1. Today, the sky above New York City is Class 9, at the other extreme of the scale, and American suburban skies are typically Class 5, 6, or 7. The very darkest places in the continental United States today are almost never darker than Class 2, and are increasingly threatened. For someone standing on the North Rim of the Grand Canyon on a moonless night, the brightest feature of the sky is not the Milky Way but the glow of Las Vegas, a hundred and seventy-five miles away. To see skies truly comparable to those which Galileo knew, you would have to travel to such places as the Australian outback and the mountains of Peru. And civilization’s assault on the stars has consequences far beyond its impact on astronomers. Excessive, poorly designed outdoor lighting wastes electricity, imperils human health and safety, disturbs natural habitats, and, increasingly, deprives many of us of a direct relationship with the nighttime sky, which throughout human history has been a powerful source of reflection, inspiration, discovery, and plain old jaw-dropping wonder. David L. Crawford earned his Ph.D. in astronomy in 1958 and spent nearly all his professional life at Kitt Peak National Observatory, on a mountaintop fifty-six miles southwest of Tucson, Arizona. By 1970, he had noticed, with alarm, a significant decrease in astronomical visibility. Tucson was growing rapidly, and so was its sky glow. With a colleague, he persuaded the city to adopt an ordinance governing exterior lighting, and later they persuaded other Arizona cities and counties to pass similar regulations. In 1988, Crawford and another friend formed a nonprofit organization called the International Dark-Sky Association. “We’re sort of a nighttime Sierra Club,” he told me, during a recent visit to Tucson. He retired from Kitt Peak in 1995 and has worked full time for the I.D.A. ever since, often putting in sixty-hour workweeks. He has the complexion of a man who doesn’t spend a lot of time outdoors during daylight, and speaks in the modulated tones of someone accustomed to talking while others are asleep. “We’re on a mission to change the world at night,” he said. The I.D.A.’s headquarters is a warren of small offices, accommodating a dozen or so staff members and a shifting group of volunteers and researchers, around the corner from a (non-related) store that sells light fixtures. Crawford and his staff devote much of their time to proselytizing for dark-sky regulations and working with manufacturers to improve lighting products. Hanging on a wall in a conference room is a map that shows the geographical distribution of the organization’s eleven thousand members. The states with the highest representation are California (fifteen hundred and thirty), Arizona (six hundred and seventy), New York (five hundred and one), and Massachusetts (four hundred and eighty-two). The I.D.A. also has members in seventy-eight foreign countries, including Iraq and Iran, where astronomy is a popular hobby, especially among girls and young women. Authorities in Sa’adat-shahr, about four hundred miles south of Tehran, periodically cut off all electric power in the town in order to improve visibility at nighttime “star parties” conducted by a local teacher. The mall’s large parking lot was fully illuminated—as we walked from the car to the restaurant, I had no trouble reading notes that I had scribbled in my notebook—but it was free of what dark-sky advocates call “glare bombs”: fixtures that cast much of their light sideways, into the eyes of passersby, or upward, into the sky. Tucson’s code limits the brightness of exterior fixtures and requires most of them to be of a type usually known as “full cutoff” or “fully shielded,” meaning that they cast no light above the horizontal plane and employ a light source that cannot be seen by someone standing to the side. These are not necessarily more difficult or expensive to manufacture than traditional lights, and they typically cost less to operate. Calgary, Alberta, recently cut its electricity expenditures by more than two million dollars a year, by switching to full-cutoff, reduced-wattage street lights. Diminishing the level of nighttime lighting can actually increase visibility. In recent years, the California Department of Transportation has greatly reduced its use of continuous lighting on its highways, and has increased its use of reflectors and other passive guides, which concentrate luminance where drivers need it rather than dispersing it over broad areas. (Passive guides also save money, since they don’t require electricity.) F.A.A.-regulated airport runways, though they don’t use reflectors, are lit in a somewhat similar fashion, with rows of guidance lights rather than with high-powered floodlights covering broad expanses of macadam. This makes the runways easier for pilots to pick out at night, because the key to visibility, on runways as well as on roads, is contrast. After dinner, Crawford showed me his home, in a subdivision of small, closely spaced, desert-colored stucco town houses. Tucson gives individual neighborhoods the right to choose whether they want street lights (and to pay for them if they do). Most of the newer, more affluent residential areas, and a number of commercial blocks, have elected to do without. Crawford’s subdivision, to his annoyance, does have street lights, and the fixtures, though technically shielded, have frosted-glass side panels, which diffuse the light in a way that turns them into glare bombs. Crawford pointed out a cluster of mailboxes across the street from his garage. The lighting near the mailboxes was of a type that Crawford calls “criminal-friendly”: it was almost painful to look at, and it turned the walkway behind the boxes into an impenetrable void. “The eye adapts to the brightest thing in sight,” he said. “When you have glare, the eye adapts to the glare, but then you can’t see anything darker.” The human retina contains two kinds of photoreceptors—cones, which react quickly to fine details and colors, and rods, which, though slower and bad at colors, are far more numerous and many times more sensitive to light. It’s mainly the rods that enable us to see at night, and they are so sensitive that they can take up to an hour to recover their full function after exposure to a light source no brighter than a desk lamp. Deer, which have an even higher proportion of rods to cones, have excellent nighttime vision but appear extremely vulnerable to temporary blinding by bright light—perhaps a reason that they have difficulty in getting out of the way of cars on dark roads. People may experience a similar phenomenon driving away from a highly illuminated outdoor area, such as a gas station with an intensely bright canopy. Much so-called security lighting is designed with little thought for how eyes—or criminals—operate. Marcus Felson, a professor at the School of Criminal Justice at Rutgers University, has concluded that lighting is effective in preventing crime mainly if it enables people to notice criminal activity as it’s taking place, and if it doesn’t help criminals to see what they’re doing. Bright, unshielded floodlights—one of the most common types of outdoor security lighting in the country—often fail on both counts, as do all-night lights installed on isolated structures or on parts of buildings that can’t be observed by passersby (such as back doors). A burglar who is forced to use a flashlight, or whose movement triggers a security light controlled by an infrared motion sensor, is much more likely to be spotted than one whose presence is masked by the blinding glare of a poorly placed metal halide “wall pack.” In the early seventies, the public-school system in San Antonio, Texas, began leaving many of its school buildings, parking lots, and other property dark at night and found that the no-lights policy not only reduced energy costs but also dramatically cut vandalism. Most people don’t notice bad nighttime lighting; if you do, it can make you slightly crazed. When I’m driving at night, my wife has to tell me to watch the road instead of looking back over my shoulder at a yard whose trees have floodlights in their branches, or at an empty parking lot so bright that you could deliver babies in it. The Connecticut town where I live was incorporated in 1779. Many residents are protective of the village green, and become agitated if anyone suggests doing something to it that they consider unhistorical, such as painting a house a color other than white. Yet the green’s focal point, the two-hundred-plus-year-old First Congregational Church, is lit up at night like a convenience store, and with two jarringly different types of illumination: the broad portico is lit with warm incandescent lamps, while the steeple and the clock tower are bathed in the icy glare of six mercury-vapor spotlights. A friend lives across from the church, and the lights give her living room a cold glow, as though someone had forgotten to close the door of a refrigerator. Obviously, Americans two centuries ago didn’t point spotlights at their buildings (and therefore enjoyed the extinct pleasure of seeing those buildings by moonlight and starlight), yet I would bet that most of my town’s residents, if they think about it at all, consider lighting up an old New England church not an offensive anachronism but almost a matter of civic duty. I’m the chairman of my town’s zoning commission, and we recently adopted our first regulations governing residential outdoor lighting. The rules prohibit unshielded exterior lamps and limit the lighting of trees and other vegetation, but, like all our regulations, they apply only to installations made after the date of the change, and they will be difficult to enforce. It doesn’t help that the town itself is a conspicuous offender. A walkway near the town hall is lit by pole-mounted “Colonial” lanterns of a familiar type, with unshielded lamps and poles a bit less than six feet tall, so that most of the light is projected into the eyes of pedestrians. When the lamps are turned on, the base of each fixture casts a dense black shadow, about sixteen feet in diameter, onto the grass and pavement directly below it, as though the purpose of the lamp were to shed darkness rather than light. Some residents have objected that the new lighting regulations unnecessarily limit the freedom of individuals to do as they like on their own property. But photons don’t stop at lot lines. (If someone installed a basic Home Depot wall pack on the moon and aimed it at the Earth, you’d be able to see the light, when it wasn’t itself in direct sunlight, with a moderately powerful hobbyist’s telescope.) People who decide to illuminate their trees at night, or to install unshielded floodlights on the corners of their garage, shining into a bedroom in a house next door, are making a decision for their neighbors as well as for themselves. Growing numbers of us pass most of our waking hours “in a box, looking at a box,” as Dave Crawford put it: we spend our days inside offices, looking at computer screens, and our evenings inside houses, looking at television screens. Fewer and fewer of us spend much time outside at all, except in automobiles—and when we do venture outdoors after dark we are usually just stepping into yet another box, the glowing canopy that our lights have projected into the sky. Although nighttime lighting has seldom been a priority of environmentalists—one of whom described it to me recently as a “soft” issue—bad or unnecessary lighting not only wastes billions of dollars’ worth of energy every year but also can wreak havoc on ecosystems. Migrating birds can be fatally “captured” by artificial lights, a fact that was made obvious a half century ago, when early versions of a common meteorological device called a ceilometer—which used a powerful vertical beam of light to measure cloud ceilings—sometimes killed thousands of migrating birds in a single night. Artificial light can be especially lethal to insects. Gerhard Eisenbeis, a German entomologist, has written that outdoor lighting can have a “vacuum cleaner” effect on local insect populations, causing large numbers to be “sucked out of habitat.” An earlier German study showed that new, brightly lit gas stations initially attracted large numbers of insects, but that the numbers fell rapidly after two years, presumably because local populations were decimated. One of the several ways in which light fixtures kill insects is by causing them to rest on the ground or in vegetation, where they become easy prey. In Florida, artificial lights have had a disastrous impact on sea-turtle populations. During the summer and the early fall, hatchlings, which emerge primarily at night from nests on Florida beaches, are often fatally attracted to street lights, house lights, and other sources of unshielded artificial illumination, dying after being drawn into open areas, where they are easily attacked by predators, or onto roads. The problem is that newborn sea turtles instinctively move toward the brightest part of the horizon—which, for millions of years, would have been not shopping malls and beach houses but the night sky over the open sea. The day after Dave Crawford and I inspected nighttime Tucson, I drove five hundred and fifty miles north to Bryce Canyon National Park, in southern Utah. That evening, I joined about two hundred people, including many children, outside the visitors’ center, where telescopes of various sizes had been set up in the parking lot. Several were equipped with computerized tracking devices, which could be programmed to find and follow interesting objects in the sky. At one station or another, I saw the four Galilean satellites of Jupiter (tiny dots in a line), Saturn (with rings), a dense group of old stars, known as a globular cluster, a pair of twin stars (one blue and one gold), and the mountains and valleys that Galileo saw on the moon. With just my own eyes, I saw the orbiting Hubble Space Telescope, which rapidly crossed the sky just before eleven o’clock, and, a little later, I saw the meteor-like flash of a passing Iridium satellite. I spoke with Chad Moore, the program director of the National Park Service’s Night Sky Team. “Many people who come to our programs have never really looked at the night sky,” he told me. “A woman once came up to me and said, ‘The moon was out during the day this morning—is that O.K. ?’ ” Moore, who is in his mid-thirties, created the Night Sky Team in 1999. Its mission, he said, is not just to increase interest in stars but also to remind people, including higher-ups in the Park Service, that national parks don’t go away when the sun sets. We walked north along the rim trail, on which the setting moon cast long shadows. The canyon’s edge was just a few feet to our right, but I could easily tell where the path ended and the abyss began. The canyon itself was transformed. In bright sunlight, Bryce’s orange-and-white limestone hoodoos, which look a little like enormous drip castles, are so vibrant that they almost shimmer; by night, the formations are virtually monochromatic, like mountains at the bottom of the sea. Nightfall inverts the park: the cliffs draw inward, and the sky becomes almost topographical, a canyon turned upside down. At last, the moon disappeared below the horizon. I could see, at various compass points, little bulges of sky glow projected by a couple of nearby towns, by one or two more distant cities, and by Ruby’s, the famous, light-encrusted Bryce-area motel and campground, a few miles away, but the sky directly above us was very dark and was filled with stars. I had no trouble seeing the Milky Way, a broad, densely speckled stripe extending across the sky. Moore pointed out the Great Rift, a cluster of dark patches caused by clouds of light-blocking interstellar dust, and the constellation Sagittarius, toward the luminous center of our galaxy. I lay on my back on a bench and watched for meteors, which streaked past every few minutes: in a truly dark sky, shooting stars are too numerous to bother wishing on. We stayed until we noticed the first glow of the approaching sunrise. Stars near the eastern horizon melted away ahead of it, as though the darkness itself were dissolving. A couple of hours later, after the sun had set completely, Moore and I headed for Owachomo, one of the park’s three natural bridges—which were created, thousands of years ago, by fast-flowing streams that undercut the sandstone walls of their canyons. Owachomo, at its midpoint, rises more than a hundred feet above the canyon floor and is almost two hundred feet across. As we turned a corner on the path, it suddenly loomed before us, a startling black void against a field of stars, like a long, ragged strip torn from the sky. After checking the ground for rattlesnakes (we had encountered one already), Moore and I leaned against some big rocks and simply looked. If I stood still, I could see stars apparently blink off, as the earth’s rotation caused them to be occluded by the sandstone bridge, while, on the other side, others seemed to blink on. The park is so remote that there is little artificial noise, especially at night, and the silence deepened the darkness. Thinking about the incomprehensible distances above us made me remember nights forty years before, when I was twelve years old and lying on my back in a mountain meadow at summer camp in Colorado, watching for shooting stars in what was probably the darkest sky I’ve ever seen, or will ever see.